Bina' Al-Ummah (ISSN 1907-2597) is a journal published by the Dakwah Faculty, Raden Intan State Islamic Institute of Lampung, INDONESIA. 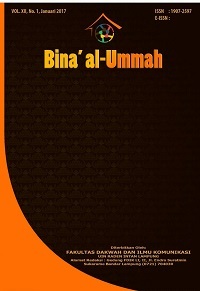 Bina' Al-Ummah published twice a year. Bina' Al-Ummah focused on the dakwah studies, especially the social development, islamic communication and islamic counselling. This journal warmly welcomes contributions from scholars of related disciplines.